Hi i have had terrible redmarks on my forehead for over a year now and they have barely faded. I am on all types of acne stuff and a prescription too but nothing helps. What all have you tried for them? baking soda, diffirent foods and tons of water, fish oil suplements, doxycycline, bananas to restore bacteria, duac topical gel 5 and 10% benzoyl. water/green tea, baking soda, exercise. probiotic. would say doxy will help. will give you the squits and all sorts like it did me. plus it will kill the good bacteria..
What do i do with the water/green tea and r you saying i shouldn't take doxy? Also probiotic is just restoring good bacteria right not like a pill? I have the same problem! Mine are all over my face, especially my cheeks and chin. I came across a topic about Niacin that I found really interesting and there is a skin whitening soap mentioned in it that I am hearing good things about. It's called Likas Papaya Whitening Soap and it's all natural. I'm starting to use it today and am hoping the marks will fade. I normally roll my eyes at anyone telling me that this magic soap, pill (or whatever) will work, but after seeing the original poster's before and after pictures I was sold. It's also very inexpensive so you wouldn't be out a whole lot of money by just trying it. well i was on doxy and the side effects where not nice and i am also seeing the aftermath now. 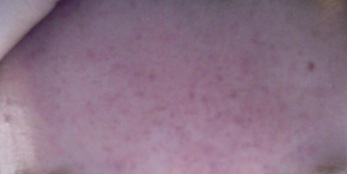 i have lots of blotchy patches which i am unsure how to get rid off. i heard extra virgin olive oil is great! and lemon juice, drink water and lemon. green tea's just drink a few a day and continue drinking water. also zinc helps skin regenerate and the body will naturally do this every 28 days. so stay off any alcohol for a month because its toxic for the body. that link someone else suggest with the likas soap is a very good read. cod liver oil/ zinc/ multi vit/ plus i bought these "amazing" pro biotic pills to really help my intestines and digestive system out.